Heat up the sands of Café del Mar as you party with us during this festive season of BEER! Join DJs P@t and Kenneth Francis as they serve up a buffet of electronic dance music to accompany an afternoon of beer, sausages, sun, friends, eye-candy, foam... and loads of belching fun! 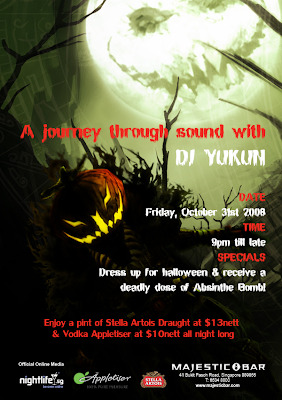 A homely gathering of sorts this Halloween for all our close mates, good friends and like-minded peeps as Yukun graces the cosy premises of Majestic Bar (3rd floor) for a night of deep and light progressive trance sounds. Personal mates who wish to get on Yukun's guestlist, please SMS / email him your attendance and get a complimentary welcome drink. Limited availability on the list only!